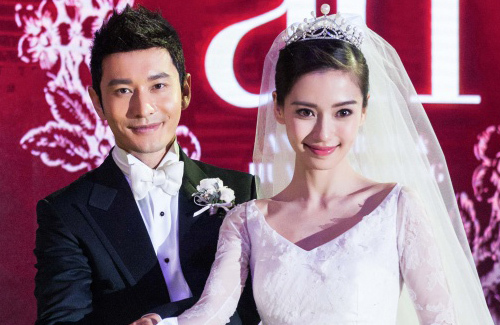 Mainland Chinese actor Huang Xiaoming (黃曉明) and Hong Kong model/actress Angelababy (楊穎) officially tied the knot in a grand wedding ceremony in Shanghai on October 8. 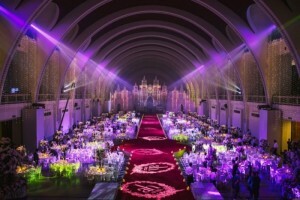 More than 500 people were present to witness the fairy-tale wedding. 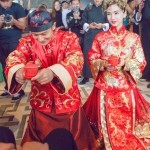 Initially dressed in traditional Chinese wedding attire, Xiaoming and Angelababy later changed into a suit and gown for the exchanging of vows. 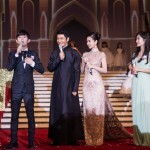 Both husband and wife teared up when Angelababy was led by her father up the aisle and to Xiaoming’s side. 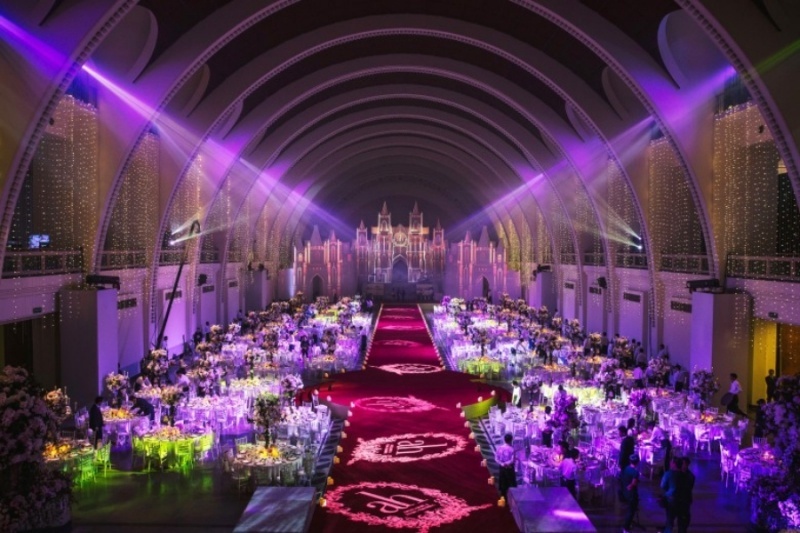 The wedding ceremony was held at the Shanghai Exhibition Center, which was transformed into what seemed like a garden castle for the event. 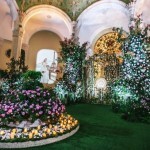 The stage was covered in fresh flowers and trees, arranged in ways that reportedly took almost 48 hours to complete. Even the wedding cake resembled a castle tower, complete with a mini carousel. 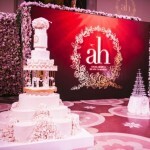 In total, Xiaoming and Angelababy invited 527 guests to their wedding, a number chosen because they registered their marriage on May 27 and because, in Mandarin, “527” sounds similar to “I love my wife.” The guests were seated at 66 tables, though the table numbers themselves reached 80 due to the exclusion of unlucky numbers. 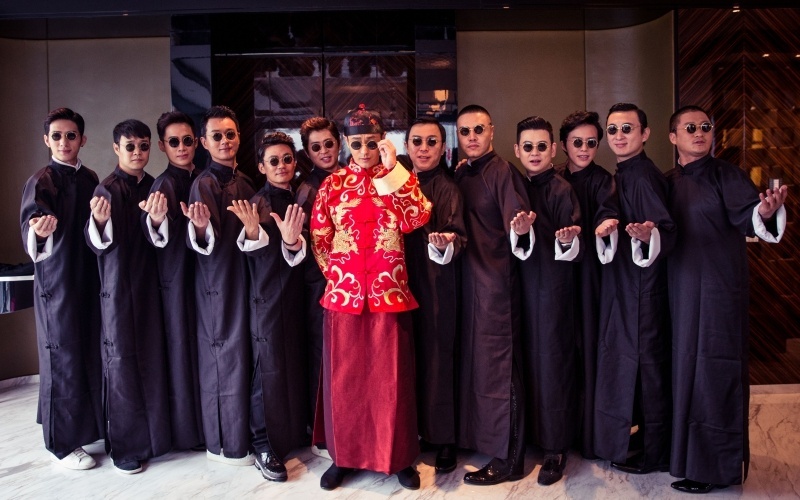 Xiaoming’s groomsmen included Jing Boran (井柏然), Xiao Shenyang (小沈陽), Tong Dawei (佟大為), Wang Baoqiang (王寳强), Li Yundi (李云迪), Wang Sicong (王思聰), and Jacky Wu (吳京). More than 100 celebrities from mainland China, Hong Kong, and Taiwan were in attendance, including Vicki Zhao (趙薇), Han Hong (韓紅), and Wong Cho Lam (王祖藍). 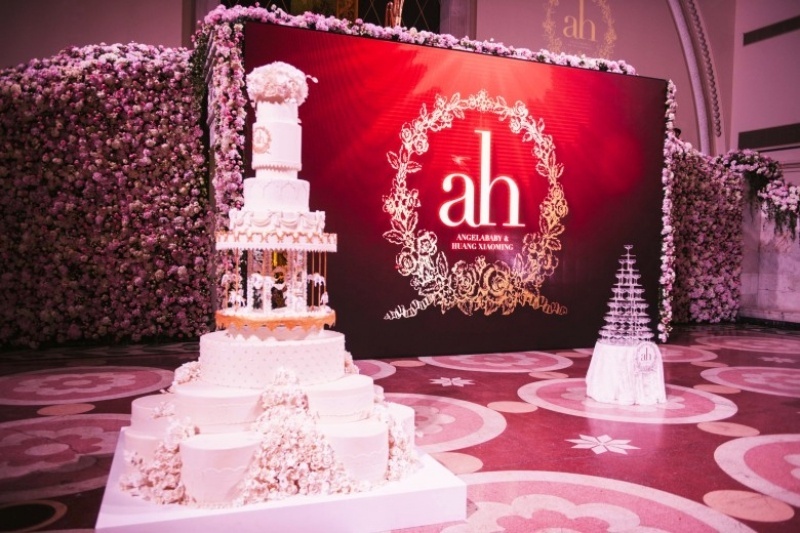 Despite the exquisitely constructed garden castle and Angelababy’s gleaming diamond crown, the most impressive aspect of the ceremony was undoubtedly the gifts to charity that the couple incorporated into their wedding. The two were offered sponsorships by many big-name brands, but they rejected them all in favor of giving back to society. 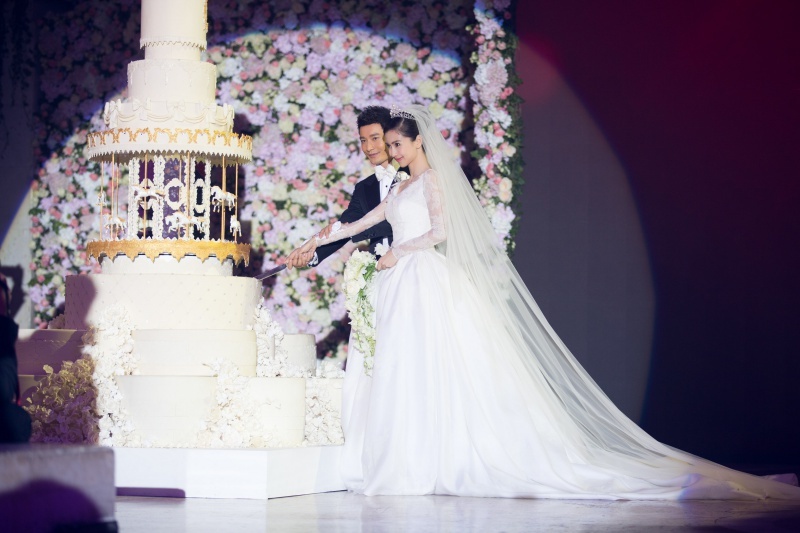 On the day of the wedding, Xiaoming surprised everyone present, including the bride, by announcing that he had established a charity fund in Angelababy’s name. In a video played during the wedding, Xiaoming is seen visiting hearing-impaired children at a welfare agency. He then revealed that he had provided financial aid to 527 of these children, one for every guest at the wedding. After the video, five hearing-impaired children went up on stage to perform a song. 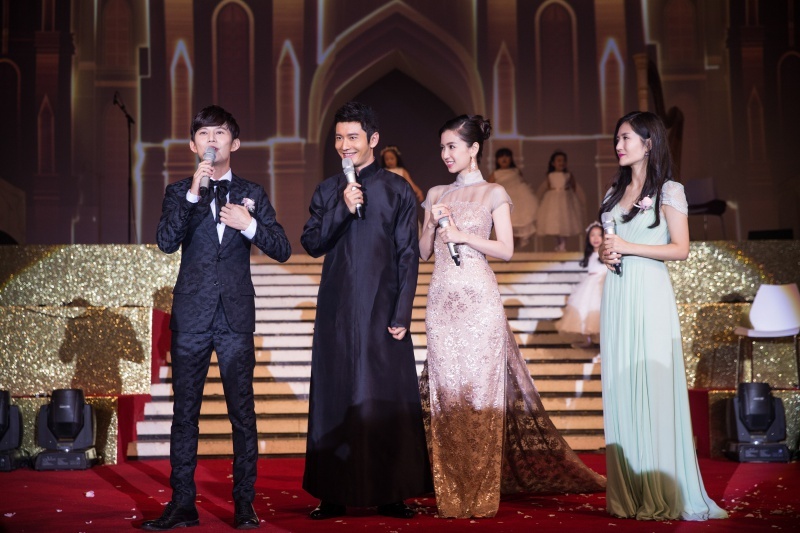 These children were personally invited by Xiaoming and Angelababy to Shanghai in order to go sightseeing and perform at their wedding. 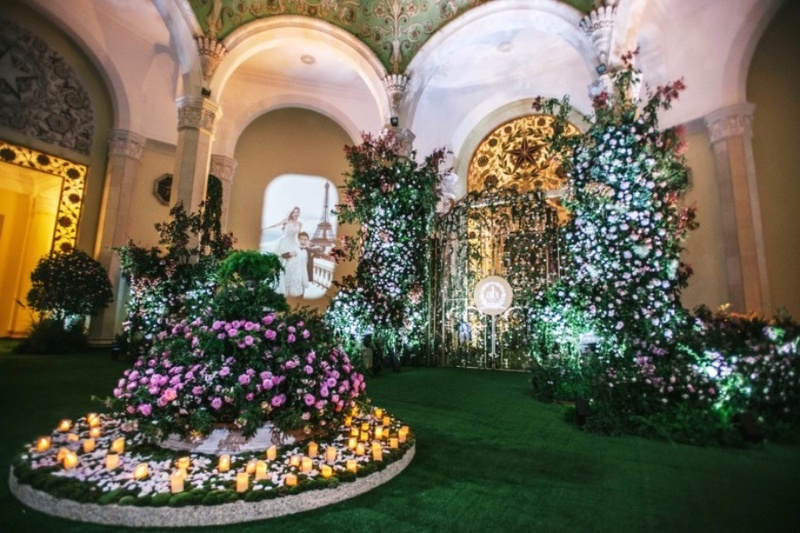 Xiaoming also announced that all of the trees that had been used to construct the garden on stage would be donated to social welfare organizations, in the hopes that they could be further used to improve the homes and environments of disabled people. Previously, Xiaoming and Angelababy had surprised their friends and relatives with special wedding favors, which contained cookies baked by disabled people who had received vocational training at a charity organization in Nanjing. 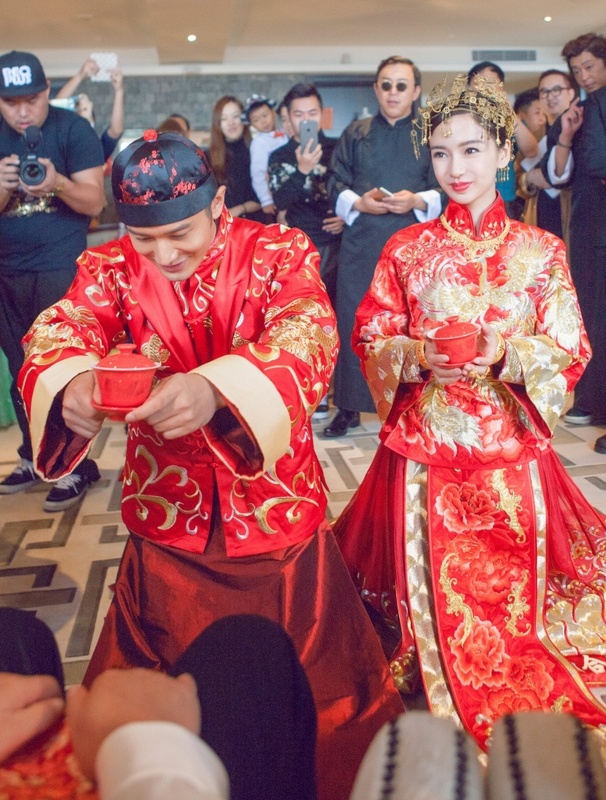 Through these wedding favors, Xiaoming and Angelababy hoped to encourage their wedding guests to support disabled people. Wedding dress a bit underwhelming. But the chinese wedding dress is stunning except the colour perhaps a but muted. 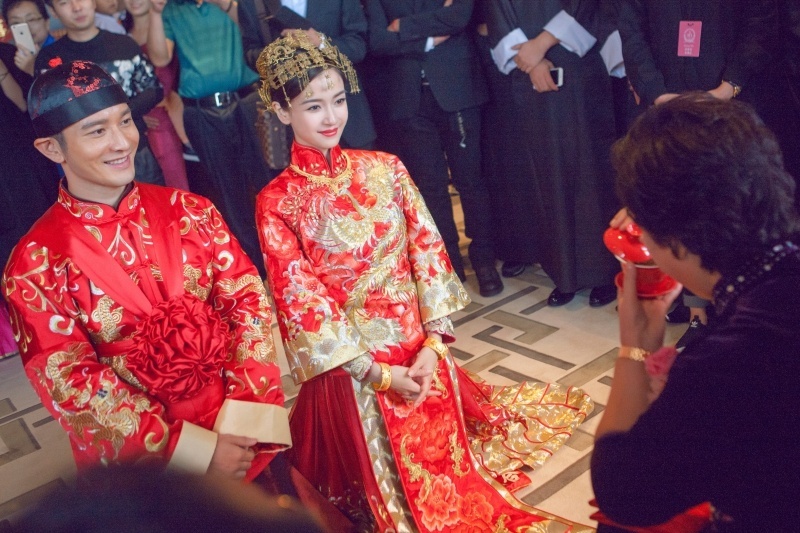 chinese wedding dress for bride is lovely, but the bridegroom’s min-guo era chinese outfit is not flattering. I’m more interested in the carousel wedding cake. @isay Just from reading your comment at first, I thought the whole cake is like a carousel where it spins. Then I saw the picture, they just put a carousel between the layers. Disappointed! Lol. i love the chinese outfits. Congrats! the white wedding dress is a bit too simple. everything else looks really nice! I like the theme of this wedding evry much. A lot of thought has gone into planning to make sure a lot of the decorations are not wasted and gone to a good cause. And the simpleness of the dress shows these two are not out to flaunt their wealth and are really out to celebrate their love and union. I am really glad that HXM and AB found each other! Congrats to them both! @elizabeth “And the simpleness of the dress shows these two are not out to flaunt their wealth and are really out to celebrate their love and union.” Eh a bit contradicting don’t you think? Nothing else about this wedding is simple, from their fancy save the date and invitation to huge guestlist to numerous dresses, including the fancy red wedding dress (which I really like). My theory that she chose a simple white dress to be like Kate Middleton from the lacy long sleeve and conservative neckline. Regardless, they got the money, the body, the look and the love, so be it and congrats to them! @jjwong if you compare their wedding to other rich chinese people getting married with all the gold, cars, food, etc, their wedding looks relatively simple. I am not against people spending money in their wedding as it is a once in a lifetime event and one should spend money on it if they can afford it. But what I have noticed is that the wedding is really done the way they want to and they have invited close friends only for some fun. In the interviews, there is no mention of how much this costs, or who designed this, or what upcoming movie is on, etc… which i find nice and non-pretentious. The publicity was always unavoidable due to their fame and also their guests..
Ok, we all hope for a wedding to be a once in a lifetime deal,but sadly that is rarely the case these days. Not trying to say it is the case here,but you get my point. Anyways,I think their wedding is not that simple but not really over the top either. It is somewhere in between. But it is great that their theme is to give back to society and to think of the less fortunate even on their special day. I find that really special because most people do not do that. Not a fan of her wedding dress but that cake look amazing!!!! Wow! Really good Wong Cho Lam was there as I hoped. When he and Leanne posed for photos with the newly wed, I am pretty sure all invitees gasped in horror as they see how completely incompatible the two of them are as compared to HXM and Angelababy. I bet he and Leanne ashamedly left the ceremony in a hurry. @freedalas oh give WCL and Leanne a break. A marriage is more than just looks. Just let the broken record speak to herself. Hopefully she will get bored and shut her smelly old mouth up. With 527 on hand at an estimated average of US$10,000 per head in gifts, which is common for affairs of this scale, they should have raked in a total gross of about US$5.27 million for this production. Say they had spent about US$1 million to put this whole affair together, less the potential tax write-off for donating the trees afterward, they should still net about US$4 million for an evening of work and still coming across as some hopeless romantics and philanthropists. Not bad Aye? They must have some brilliant financial advisers in addition to wedding planners. LOL!! I hope freedalas’ favorite dwarf is paying attention and maybe he could learn something. @aiya Horrible calculations. Just selling exclusive rights to their wedding pictures and/or broadcasting rights of their wedding night could make them much more than a mere $5M USD. Your average of $10k USD per head is way off. Let’s not forget that there’s HXM & AB’s parents, family and family friends. Not everyone can afford that kind of money. Besides, most people find giving money at weddings to be tacky. Your speculation is as good as mine. It seems we both agree that the couple would make a lot of money of this affair. US$10K per head is quite common for an affair of this scale, just check out some charity balls. True that some will pay less but that would be more than made up by their powerful celeb friends who could afford to pay even more. FYI Cash gifts are quite common in Chinese weddings because I don’t see them having a registry in Walmart. @aiya Actually no, I don’t agree they made a lot of money on their wedding. If their end goal is to make a lot of money there are many other ways to guarantee higher returns, like selling exclusive rights to their wedding pictures and/or broadcasting their wedding night. Just these two options would guarantee a much higher return. There’s at least 30 other ways the couple could make money off their weddings but refused to take on those offers. Your “money gift” option is by far the worst option and I doubt the amount is as high as you mentioned. Just because HXM and AB has a lot of celebrity friends doesn’t mean each and every one of them gave them money or the amount you stated. 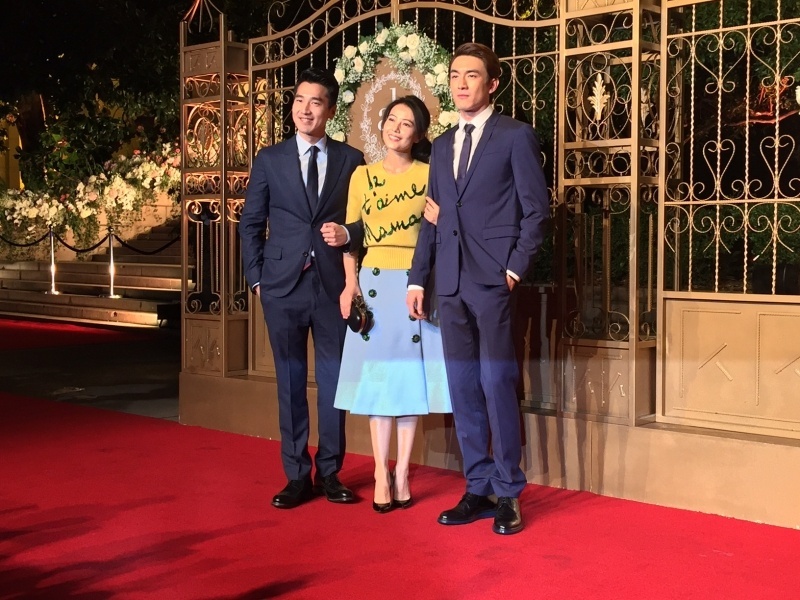 Let’s not forget even though this is HXM and AB’s wedding, there’s also friends of their parents that would attend the wedding. I doubt most of them would offer 10k USD per head as a gift. Angela Yeung’s wedding dress is rather disappointing. She got it custom-made in Paris by Dior. She seriously wanted the style to encompass modern Princess, its so obvious. Its a shame that its not that flattering its like she’s been swallowed up in it. She looks way better in the outfits in their professional wedding photos. I note the back of the wedding dress has a love heart cut out similar to Hannah Quinlivan’s wedding dress (who married Jay Chou). However Hannah’s cut out heart is way more obvious. Whats with these young model brides and wanting a fairytale/princess wedding?? lol…. Its very touching to know that HXM put so much thought into charity work, with their wedding gifts, recycling the dresses, and providing financial aid to hearing impaired people. I agree that her dress seems a bit too simple and looks a bit cheap. But of course we all it was not cheap and was custom designed,took months to make,etc… However, the result was not so great. I personally do not really like the princess themed dresses much. I probably am in the minority here – found the simple but classic wedding dress tasteful. It suited Angnela – with her own pretty, dainty petite frame … she is wearing the timeless dress, NOT a case of the dress wearing her (which can be the situation with many brides). As can be the case with some far too ornate, ‘too much dress’ (as in overwhelmingly fabric, and too much of it) and trying too hard to show off outfits. Or horrendous ‘birthday’ cake type wedding dresses. Or those who try too hard to be unique and different, ending up ‘outstanding’ with designs which will date. Hers seemed simple, but timeless to me. Nicer if in ivory off white. I LIKE the whole concept of their wedding – very meaningful they thought of the less fortunate, and how to use this occassion to include them so thoughtfully. Extravagance yes, but balanced out and not all wasteful self-centered glitz. I think Angela’s dress is one tha grows on you. You may not like it at first glance,but will grow to like it. Sometimes simple is better rather than go all fancy just for it all to backfire. Her dress does sort of remind me of Kate Middleton’s dress. I guess they want this princess like theme. 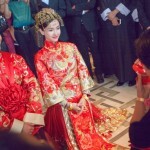 I actually liked Stefenie Sun’s wedding dress as well since it was simple yet elegant and fit her small frame very well. I also loved how they used their wedding for such a good cause and thought of the less fortunate. Very thoughtful and kind of them. They did spend a lot but of course it is their wedding day, so that is understandable. However,the whole theme of thinking of the less fortunate made everything so much meaningful. I have liked XiaoMing ever since the beginning of his career so am glad he has found happiness. Hopefully,they will have a lifetime of happiness together. Congrats to them! Also they did not invite 3000 guests as previously stated. I think that is another example of not believing everything stated in articles. Will this be the end of AB/HXM-bashing on this site? Seems that AB and HXM are not as repugnant as so many Jaynestar bloggers have said.